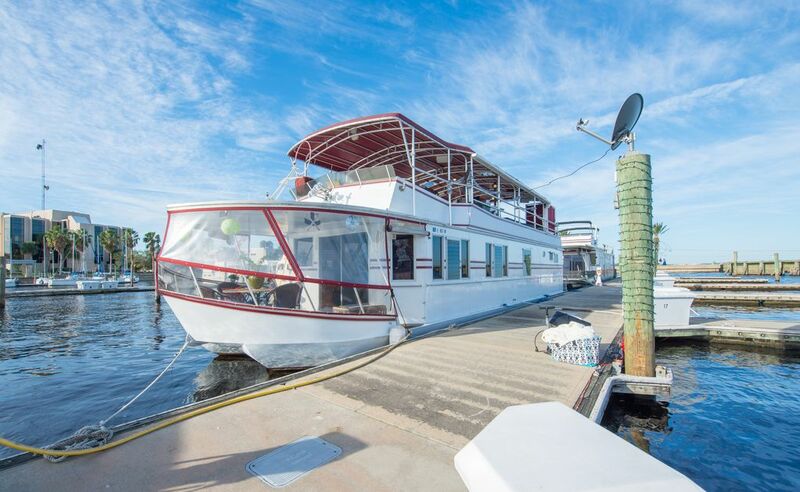 Luxurious 60-foot, 2-story moored houseboat. Accommodates up to 4 people. Flat screen TVs throughout, WiFi, comfy queen-sized beds, and a kitchen with residential appliances and all the tools you need. Permanently docked in a safe, secure marina on scenic Lake Monroe, part of the St. John's River system. Just a short walk to funky art galleries, retail/antique/resale shops, microbreweries, a Belgium beer bar, wine bar, and great restaurants. Take a 5-minute car ride to the Central Florida Zoo and zip line. In 15 minutes you can be at the crystal-clear Blue Springs State Park. You are 45 minutes from Disney and the theme parks. Or just relax up top! PLEASE NOTE: The boat must stay docked. Guests are NOT permitted to drive the boat. Think of it as a floating/water-top condo. Under no circumstances may guests drive the boat. Check in is 2PM. Any late arrival request must be made during the initial reservation process. Mother and Son team. We purchased this vessel to move to south Florida where we were living at the time. Before we could, we fell in love with the city of Sanford and central Florida and decided to keep the vessel at Monroe Harbour Marina as a weekend getaway. After many enjoyable stays with friends we took their advice and starting renting the Why Knot so that others could enjoy it too. Hotels are a dime a dozen. If you are looking for a vacation you won't soon forget, with lasting memories, stay with us. Our vessel offers everything you would find at home and then some. Great View. Privacy and safety. You have the entire boat to yourself. No strangers roaming around like you have in a hotel. Gate to dock remains locked at all times. The kitchen contains full-size residential appliances, dishes, glasses, utensils, etc. There is a grill up top for cooking out. Two beach-cruisers are provided to tour the town. Walk or bike to Historic Sanford. Flatscreen TV in every room (3) and up top (1). Comfy queen-size beds (2) and 1 sofa bed. Iron, blow dryers, etc. Just bring your clothes. One full (with garden tub) and one half-bathroom downstairs. Bathroom up top with toilet and shower. Downtown Sanford is just a short walk or bike ride and boasts shops, bars, restaurants, a refurbished theater, library, post office, and lots of special events. Docked at Monroe Harbor Marina on Lake Monroe, part of the 375-foot long St.Johns River system which flows North from the Everglades to Jacksonville. Watch incredible sunsets from the top deck. See gorgeous sunsets over the lake from the top deck. 1 queen-size sleeper sofa, chairs. Living/dining combination. Table and chairs for 3. Yes but we discourage using. Small full-size refrigerator with top freezer. Full-size electric glass cooktop. Convection oven. Makes full pot or single cup. Coffee and teas provided. Full-size appliances: Range, frig, icemaker, microwave, toaster oven, coffee maker. The boat has 3 dining areas. The inside area seats 3. The "front porch" downstairs seats 4 and the table up top seats 4. Four (4) flat screen TVs. Yamaha stereo systems in salon. No game room but have a poker table top. Most of the top deck is covered. 500+ square foot upper deck under canopy. Open sides. Couches, loungers, bar, table and 4 chairs, grill, sink, small refrigerator. Great for cooking out, getting a tan, and watching the sunsets. My boyfriend and I really enjoyed staying here. The owners were lovely and showed you the lay of the land. Especially helpful if you never stayed on a boat before... The bed was super comfortable, we loved the pillows so much we are looking to purchase our own.. lol. It was quite and cozy, wish we stayed longer but would love to return.. The Why Knot was everything I had anticipated. Temps in the 90's and we stayed cool. The view from the boat were beautiful. Dock is easy access to your car or uber. It is located 3 blocks from old town shops and eateries. Boat was so comfortable, we ended spending a lot of time hanging out there. The owners were easily reached if needed. The towns people were all very friendly . I highly recommend this boat. Thanks so much for such a great well-written review. My whole family loved it. Beautiful sunsets (and sunrise if you walk over to the other side of the marina). Great food within walking distance. The boat is in great condition. My son fished off the boat and the dock. I spent most of the time on the upper open deck. I even slept on the couch out there. Can't wait to go back with my group of friends. Our family thoroughly enjoyed our time! We were seeking a unique vacation spot and the house boat offered all the uniqueness we could handle! The upper deck was fantastic! The view was beautiful! Our kids were enamored with every aspect! It was surely an unforgettable opportunity! The owners were accommodating and so very personable! We rented this houseboat while in town for a baseball tournament. We were tired of hotel rooms and thought this would be a nice change of pace. This boat is beautiful! It housed me, my husband and two 17 year old baseball players very comfortably. The lower deck had plenty of space, and we were able to buy groceries and prepare meals, which was a welcome change from eating out constantly. The upper deck was delightful. We spent each morning relaxing and reading or watching TV up there before the heat ramped up. We also grilled and ate lunch or dinner up there. We could not have asked for any better accommodations for our trip. And the hosts were delightful people who met us when we got to the boat, gave us a tour, and were very responsive to any questions we had throughout. We would certainly rent again! Thanks for great review. So glad you enjoyed your stay. Zip line at the zoo. Segway rentals.